← Packaging – people do care! I have been a tad behind at writing this blog post and responding to comments, which saddens me given the glowing responses I have got in some of my comments. In an ideal world I would like to write a post weekly, rather than the current monthly timing. I should also be responding to comments ideally within 24 hours which I am also failing to do. This blog is hobby which allows to me to share my thoughts on one of my passions – digital and social media in the pharma industry – and I do enjoy writing it. Career wise I am sure the blog helps too. Sadly working as a full time consultant, trying to support my charity, spending time with my cats, and dealing with an Auto-immune disorder which often leaves me very tired and requires me to sleep 8-10 hours a night, leaves me with very little spare time to do anything else (including blogging for my charity www.hopeforstrays.com). I occasionally also blog for my employer ZS around social media but I find that far less rewarding (for one I never get many comments glowing orotherwise!). It is the age old dilemma of too much to do and too little time. This is of course a similar dilemma that many companies face with their social media and digital efforts. A number of companies I have advised on social media where taken aback when I told them how much content and resources would be needed if they wanted to truly engage via this channel. One local brand team, for example, were adamant that they had more than enough content to set up their own Twitter feed, which warranted them going against the Corporate guidance of using the local country Twitter account. When I joined the discussion my first questions was how much content exactly? How often would they be Tweeting and what were their monitoring plans? It turned out they planned to Tweet once per week – a far cry than the recommended multiple times per day! Realising how much effort and resources (tine and financial) would be required they ended up towing the line and using the country account and appropriate #. Whilst Twitter is a particularly active social media channel that requires high levels of content and monitoring, other channels also benefit from a steady stream of new content, which takes time and money to develop. The other side of social media is of course the monitoring element. As I have already confessed I am far from following the best practice in terms of responding to comments, but I am not a large company with products and services and a reputation to defend. Whilst as an individual I can get away with taking a few days to respond, a company is expected to respond within 24 hours, 48 max. This again takes resources, as well as a clear process, to respond appropriately. This is the scary part for many pharma companies and is also the part that has led to automated responses (and there are some classic examples where automated responses go horribly wrong). It need not be scary however if you have the appropriate level of resources involved in this activity and process in place to be able to respond rapidly. Technology can do a large amount of the leg work (for example sending an alert that a response is required) and having a team of people who can respond then facilitates responding within the time-frame required. Many companies I know have 1 or at most 2 people dedicated to social media. In my opinion this is not enough. In fact for most tasks you should never be solely dependent on just one person because when that person is sick, on holiday or decides to quit, the company is left vulnerable (and given that you are probably requiring them work through holidays and sick days they are more likely to be sick, and eventually quit). That does not mean that you need to employ another dedicated resource but it does mean you have to have other employees appropriately trained so that they can step in if required. For companies looking for resources in social media but struggling with restricted headcount and resources, there is one resource that few are totally optimising – their own internal network. Looking at social media there are now many employees who are active with social media in their personal life who, with appropriate training, could be called upon to help out. It is a useful skill for many people’s career and there are many ways of rewarding or incentivising people to provide that additional support. As resources within the industry become more restricted, but the demand for digital and social content and engagement rises, the industry will need to start thinking a bit more out of the box to find solutions such as this. Sadly this is not a resource I have access to. Much as my cats take an interest in my laptop (sitting on it, walking over it, etc.) 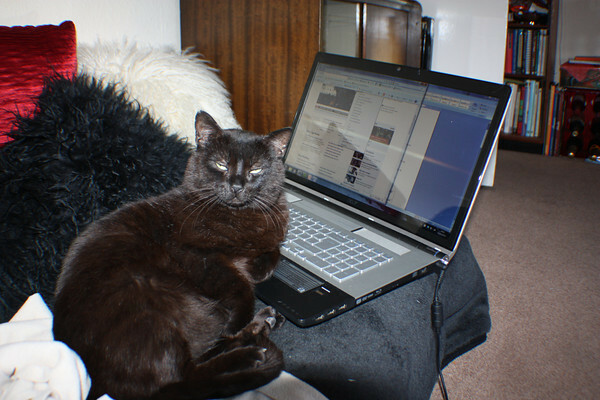 I have not yet managed to train them to write blog posts or respond to comments for me. All I can do is keep trying to find time and when I don’t, keep apologising. And perhaps posting more kitteh photos because everyone love a good kitteh photo right? Posted on Sep 15, 2014, in Content, General, Social Media, Twitter and tagged Content, Pharma, social-media, Twitter. Bookmark the permalink. Leave a comment.